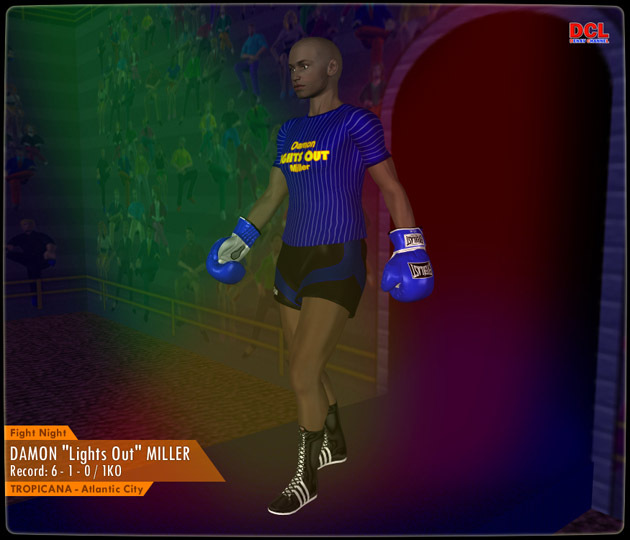 “Lights Out” Miller. Providing colour commentary is Gayle Mc Gregor who is now talking to one of the participants in this event. Mr. Miller’s trainer declined this opportunity. Let’s turn it over now to Gayle who is in the dressing room of Audrey St. John. 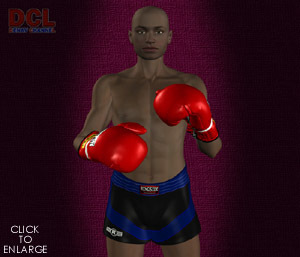 <<Hello fight fans, as you will observe, I am watching the female IFBA Light-Heavyweight World Champion Audrey St. John. questions without sounding the least winded. Her trainer tells me that Ms St. John always warms up completely before competing. testifies that she is in the best shape of her life. I am back at ringside now awaiting the entrance of the two participants. Ms St. John will make her entrance first –ladies before gentlemen. in an appreciative welcome for this winsome athlete. his chest. This 28-year-old Californian weighs 92,5kg/204lbs with a professional record of 6-wins- one by knockout and just one-loss. fans. There is no showboating by this rugged boxer. battle strategies. 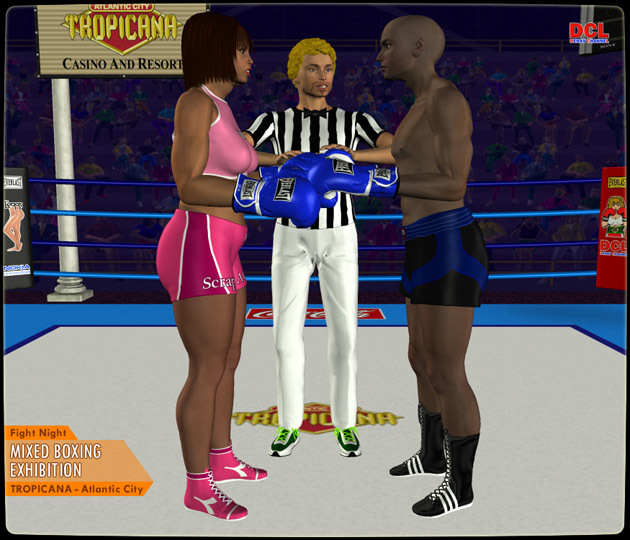 Called to center ring by the blonde-haired referee, the fans can see for the first time the fighters standing face-to-face. physically. 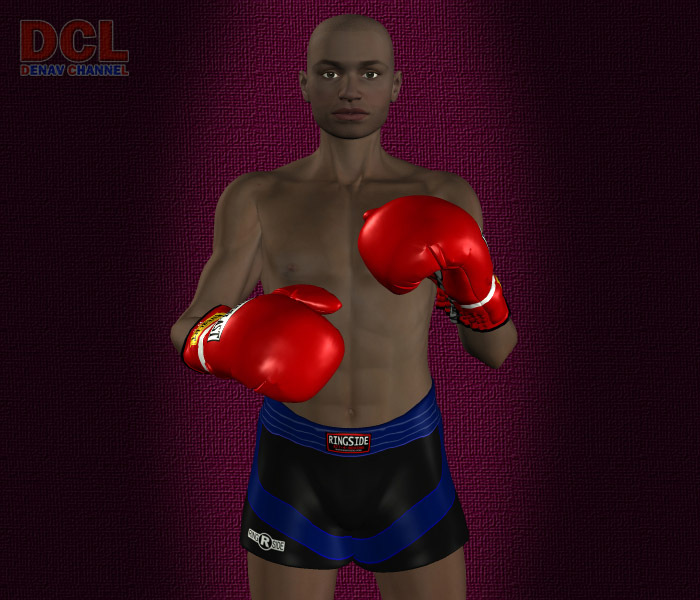 Both contenders have their “game faces” on as they touch gloves before returning to their corner. concentration and athletic grace displayed in this lull before the storm. The excitement is electric. experienced the first power shot from her male adversary. I wonder if it was harder than she expected? two. She is looking to gain some respect with more offence and certainly wants to win the round so she will not fall behind in the scoring. rival that should benefit her in the later rounds. her punching routines to win the round on my unofficial score card. “Lights Out”. They even split the gap between her gloves when she uses the peek-a-boo defense. was in the previous round. uppercut rocks him back on his heels. “Lights Out” is hurt and vulnerable. Can Audrey capitalize on this opportunity? superiority to the judges, fans and foe. her gradually backward against the ropes. Both fighters were glistening with sweat with their mouth open attempting to take in air. Damon for both the fans and the judges. ropes. Audrey resets to deliver more punishment to her reeling rival. nor needed in this final period. Ms St. John is unsteady and disoriented by that blow to her head; but instinctively she reacts to her precarious predicament. Lurching forward she immediately wraps her arms around his upper body and walks him backward into a neutral corner. This time it is the “Scrapper” leaning upon her adversary and resting her head on his left shoulder while she awaits her recovery. and his eyes close in shock. sportsmanship and agreement with the decision, Mr. Miller applauds with a gloved handclap at this conclusive announcement. 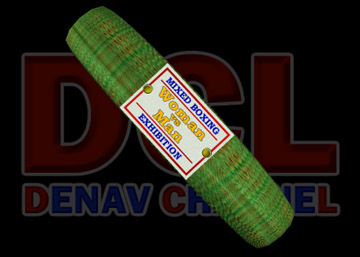 This memorable exhibition reflects favourably the superb boxing skills of these participants. In recognition of her success in this female versus male mixed boxing exhibition Ms St. John receives a green prize belt. Wearing the memento bandoleer-style Audrey poses jubilantly next to one of the sponsoring representatives from Hooters. She is a deserving winner of that trophy. This spirited encounter is an experience she will cherish long after this night is over.